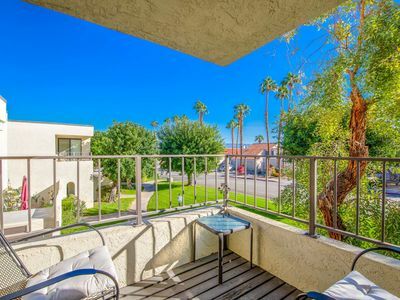 Remodeled two bedroom condo on a beautifully landscaped greenbelt with views from the patio and great room of Mount Eisenhower and the Santa Rosa Mountains to the East and South. 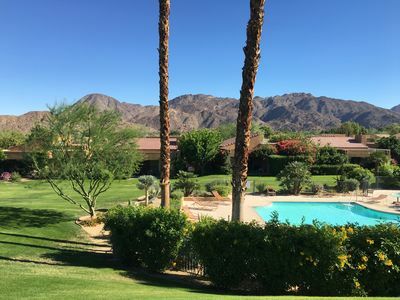 Within the gates of the prestigious Ironwood Country Club with 24 hour guarded security, it is the perfect location for a relaxing and fun vacation. 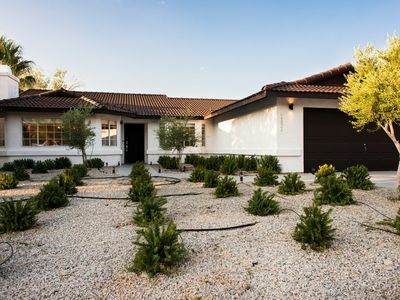 The 1250+ square feet of living space is perfect for guests looking to enjoy the beautiful weather during the fall, winter and spring seasons afforded in the desert. 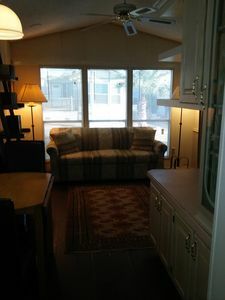 The condo has a remodeled, fully equipped kitchen with granite countertops, new cabinets and newer appliances including a gas range. The kitchen flows into the great room dining area and living area with upgraded furnishings. 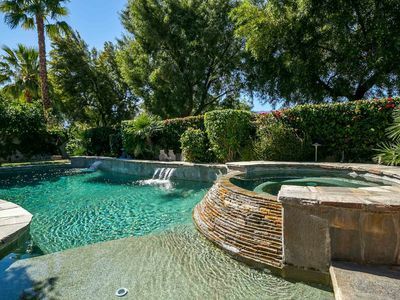 Views of the stunning Santa Rosa Mountains and greenbelt are available from the kitchen as well as the great room. 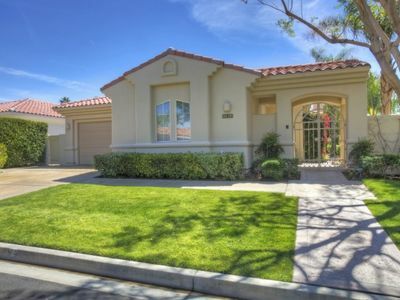 The master bedroom, which also has a gorgeous view of the Santa Rosa Mountains, has a king sized bed with updated furniture and the master bathroom has been remodeled with a granite countertop, new cabinets, a tile floor and a tiled walk in shower. 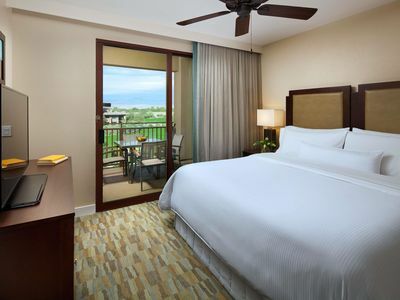 The guest bedroom, which looks out on an atrium with desert plants, has a king size bed, updated furnishings and the guest bathroom has been remodeled with a granite countertop, new cabinets and a tub/shower. Laundry facilities are in the garage and the washer and dryer have been updated. The living area is equipped with an HD flat screen TV, a blue ray player and CD stereo system. 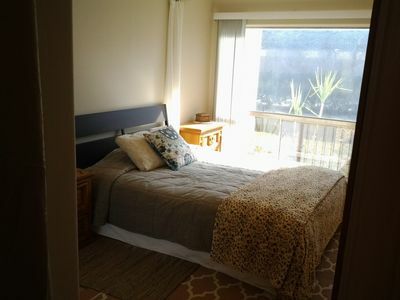 An HD flat screen TV is also in the master bedroom. Broadband internet with wireless internet access is available along with wireless telephones. All TV, internet and telephone services are provided Charter cable. 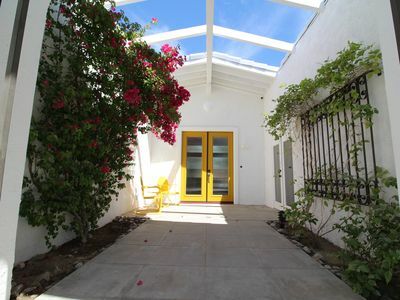 A three-burner gas barbeque is on the side patio next to the kitchen and dining area for easy access. 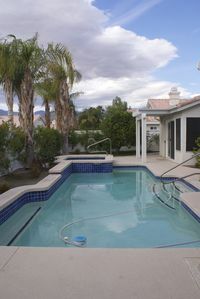 The palm tree lined heated pool and spa are only steps away and there are many other activities in close proximity. There is an abundance of hiking trails that are a close walk or run and biking is a popular activity. 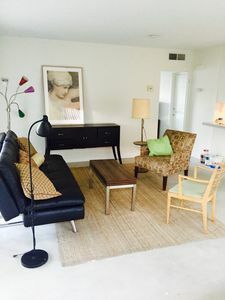 The famous Living Desert Botanical Garden and Zoo is a short 10 minute walk and it’s a 10 minute drive to the premier shopping, restaurants, and gallery’s on El Paseo Drive, the Rodeo Drive of the desert. 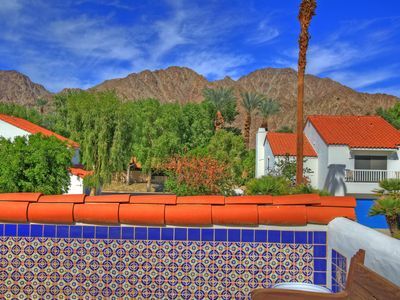 Palm Springs and the Palm Springs airport are a short 35 minutes away. 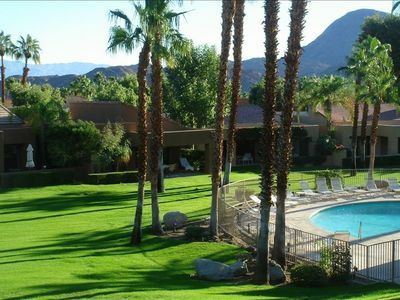 Rental does not include golf, tennis, or dining privileges at Ironwood Country Club, however short term programs are available. If interested in these programs, please contact membership director Penny Marshall at the club directly, (760) 346-0551. There are also over 100 public and simi-private golf courses in the Coachella Valley if the Ironwood programs do not work for you. There are also many special events throughout the year that may be of interest. 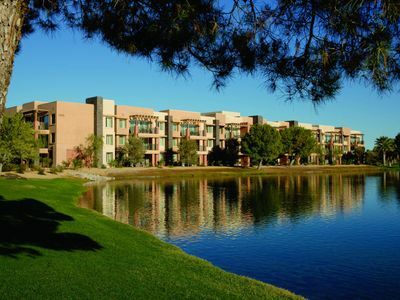 These include the Bob Hope Golf tournament, the BNP Paribas tennis tournament, the McCollum Theatre, and the Coachella and Stagecoach music festivals to name a few. No smoking, no pets, guests 21 years old or older please. 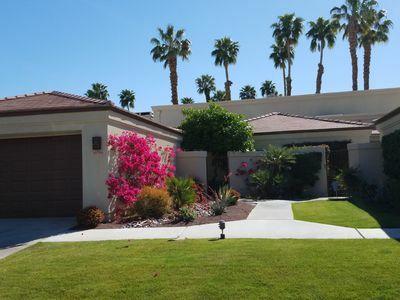 PGA WEST 3 bedrooms with spectacular views. Look and compare!! The Little Resort for TWO.